Thanks so much for your interest in contributing an article! We are an online publication dedicated to providing natural health tips and wellness inspiration to support our readers in living their happiest, healthiest lives. Please find our contribution guidelines below. We focus on providing our readers with easy-to-implement, actionable articles about health and wellness. We love things like healthy recipes, practical tips for improving health, natural skincare and beauty articles, specific yoga sequences and fitness routines, and eco-friendly tips for the home. Recipes: Lead with a paragraph that either gives an idea about how to serve the dish, or describes the nutritional benefit of one of the ingredients. Please include serving size and clear instructions. Nutrition and Health: If you mention a study or statistic in your article, please include a link to the source. Ideally, any health claims would be sourced as well, but minimally they should be fully explained and backed up. Use brackets for your relevant links [www.sciencejournal]. Yoga, Fitness and Targeted Workouts: Please provide specific, step-by-step instructions for how to execute the move or activity. For yoga specifically, please note that many of our readers are beginners to yoga. Therefore, the kinds of yoga articles we like to share are simple, practical tips about yoga (think Choosing The Right Yoga Mat, How Not to Suffocate In Bikram Yoga), as well as “Yoga Pose Spotlights”, where we focus on just one pose and break down how to do it, which areas of the body it tones and mistakes to avoid while doing the pose. If you’re uncertain about what kind of article you should contribute, check out our FAQs below for ideas on article topics. Try and use a warm, conversational tone when you write, as though you are explaining something to a friend. If you are contributing an educational article (as opposed to a How-To or List Article, e.g. 5 Ways to…), try to conclude your article with 1-3 action steps the reader can take to implement what you’ve written about. Our intention with each article we feature on the site is to provide actionable steps our readers can implement right away. Please don’t link to your product or service in the body of your article. You are welcome to link to this in your bio. We are unable to accept overly promotional articles. Please refrain from including links to products that are not in line with our philosophy of natural health (even in your bio), such as fad weight loss products with artificial sweeteners. We are fine with accepting an article you’ve written and published elsewhere previously. If you are submitting an article you previously published, please include the link(s) to where it is currently published. If you’re concerned about the idea of an SEO penalty due to publishing your article twice, check out this helpful article that discusses some myths about duplicate content. Your Article: There is no word count minimum or limit for your article. Please submit in either Word doc or Mac Pages format (no PDFs, please). Your Bio: Please provide a short bio (120 words or less) that we can include at the end of your article. Be sure to include a link to your own website and/or social media sites if you’d like to include these (they won’t count toward your 120 word suggested limit). Your Photo: Please provide a photo of yourself that we can include alongside your bio. Your photo must be at least 300 pixels x 300 pixels. Your Article Photo: If you have a great, high-quality photo that you have taken to accompany your article, you are welcome to submit it, though it is not required. Photos should be well-lit and horizontal in orientation. Please note that we aren’t able to display photos that you do not have full usage rights to (so, for example, grabbing a photo off of a Google image search isn’t our jam). We’d love for you to submit quality photos when you have them, but only if you’ve personally taken them, or if someone you know has taken them and they’ve given you explicit permission. Otherwise, we’re happy to use an image from our library. If you do submit a photo with your article, please include the source of the photo, thank you! Is there a specific article topic you’d like for me to contribute? You are welcome to submit an article on any health-related topic you would like. Many contributors like to focus on writing articles that pertain to their area of focus or target market. For example, a fertility specialist might want to contribute articles pertaining to nourishing foods and lifestyle tips that help support fertility. We love sharing what our contributors themselves are interested in! Seasonal Articles (5 Ways to De-Stress During the Holidays, How to Navigate a Holiday Dinner with Food Allergies, 4 Spring Detox Smoothie Recipes, 6 Back-to-School Dinner Ideas, 5 Abdominal Exercises to Get Ready for Summer). Please try to send these at least one month prior to the season you are writing about to allow us time to publish it. I noticed that some of your articles don’t include a bio from the author. Will you include my bio if I submit an article? Yes! 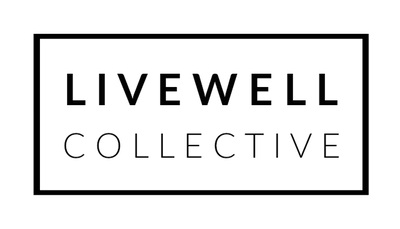 The articles you see that don’t include bios or photos of the author are articles that we ourselves have written here at LiveWell Collective. Any article you contribute will include your bio and photo. I’m not sure my recipe or article photos meet your guidelines. Should I still send them in? Sure! If we don’t feel they meet the guidelines, it won’t deter us from publishing your article; we’ll probably just replace the photos themselves with some of our own. I’ve never written a bio! Can you provide some direction? (name) is a (profession) based out of (city, state). She is the writer/creator/nutritionist/acupuncturist for (name of book, blog, practice, etc.) and (something personal about yourself). Then give your website. Sara Jones is a gluten-free food stylist and photographer based out of Atlanta, Georgia. She is the creative mind behind healthyfoodblog.com and when she’s not creating gluten-free treats, she loves playing her guitar or hiking with Franklin, her snuggly Scottish terrier. You can follow along with her culinary adventures at healthyfoodblog.com. Elizabeth Schwarts is a holistic nutritionist based out of Portland, Oregon. She specializes in supporting with women with fertility in her practice, Nourished Roots Nutrition. When she’s not working one-on-one with women, she enjoys sharing healthy recipes on her blog, nourishedrootsnutrition.com and spending time with her husband and two nature-loving little girls. Find our more about Elizabeth on her site, www.nourishedrootsnutrition.com. Once I contribute my article, how long will it be until it is published? We generally schedule articles in the following quarter that they were received. For example, if you submit an article in February (Q1), it will usually go live in Q2 (April-June). Therefore, if you would like to submit a date-sensitive article (such as a holiday or season-specific article), please submit it in the quarter prior to the holiday or season you would like it published. We will follow up with you after you submit your article to let you know the specific date you can expect it to be published. By contributing to our site, you are agreeing to any form of editing that our editorial team deems necessary, and you are accepting our terms, which can be found here.